in Cairo 7th – 8th century H.
Our master Muhammad Wafa was among the foremost knowers of Allah. He informed his son Sayyidi ‘Ali that he was the seal of saints and had been endowed with a lofty rank. He was unlettered, and his expressions on mysticism are peculiar [gharib]. He has many writings, some of which he composed at the age of seven (or ten). His use of allusions in poetry and prose appear cryptic even in our age. To our knowledge, in fact, no one has unlocked their meanings. He was named Wafa after the waters of the Nile had failed to rise during its annual inundation (wafa). The inhabitants of Cairo resolved to make a migration but the shaykh went to the river and said, ‘Release (your waters), by the permission of Allah Most High.’ On that very day, it rose by seventeen cubits and inundated the lands, so people called him Wafa. His numerous works include Kitab al-Arush and al-Sha’air[al-Irfan fi Alwah al-Kitman], as well as a great anthology of poetry. He was born in Alexandria, in AH 702. He grew up there and treaded the spiritual path of Shaykh Abu’l-Hasan al-Shadhili under the guide, Sidi Dawud b. Makhila.151 He then relocated to Akhmim,152 where he married and established a large zawiya. Throngs of people paid him visits. He later moved to Rawda153 in Cairo where he devoted himself to worship and the remembrance of Allah Most High. His fame spread and reached distrant corners in both the East and West. The first Wafa’i master to move from the Maghrib to the frontier post of Alexandria was Muhammad Wafa’s grandfather, Sidi Muhammad al-Najm. He possessed splendid mystical states and worked patent miracles, and whose biography has been written by more than one author. He kept the company of the qutb, Sidi Ibrahim al-Dusuqi— may Allah show him mercy — and the two of them learnt from one another. Sidi Muhammad al-Najm was born in Sfax, Tunis, from whence the Wafa’i masters originally hail. He settled in Alexandria, becoming a pleasant abode and where he was blessed with a son, Muhammad al-Awsat, the father of our master Muhammad Wafa. Our master Muhammad al-Awsat was renowned for being a Friend of Allah and a man of knowledge and virtue. He died — may Allah have mercy on him — while still a young man, and was survived by his son Muhammad Wafa. 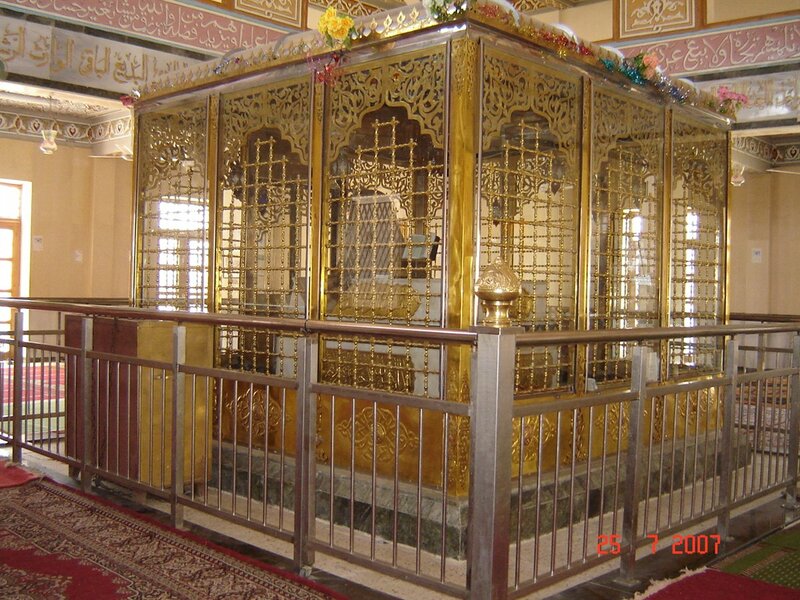 He was buried in the family’s sufi lodge called the Najmiyya Zawiya. It was named after his own father, Muhammad al-Najm, who is also buried there in the frontier post of Alexandria. When our master Muhammad Wafa passed away, he was survived by his two sons, our master ‘Ali Wafa and our master Shihab al-Din Ahmad. Our mater ‘Ali 154 was young [when his father died]. Alongside his brother, he was brought up under the tutelage of Shaykh Muhammad al-Zayla’i. When he turned seventeen, he took up his father’s place and began delivering regular lessons. His fame spread all over and the number of his followers and disciples multiplied. He resided for the most part in Cairo’s Rawda. He wrote a number of works that include a collection of invocations, litanies, admonitions, and poetry. He passed away in his house in Rawda on Tuesday, 2 Dhu’l-Hijja AH 807. By way of sons, he had Abu’l-Abbas Ahmad, Abu al-Tayyib, Abu al-Tahir and Abu’l-Qasim. His biography has been penned by more than one scholar. Our master `Ali Wafa reached the pinnacle of virtue, perfection, grace and beauty. There was no one more perfect and more beautiful in Cairo than him. He penned well-known poems and fine postclassical stanzas [muwashshahat] in which thread together secrets of the folks of the path. He was gifted the language of separation [farq] particularization [tafsil], and gatheredness [jam’]. Few saints are given this. He would often conceal himself from people, as would his brother, our master Shihab al-Din Ahmad. They would only leave the house to deliver a lesson. When our master ‘Ali died, the like of his funeral had never been witnessed before. His disciples walked in front of the coffin, invoking Allah in a way which softened the hearts of coarse people. His birth had taken place in Cairo in AH 759. As for his brother Shihab al-Din Ahmad b. Wafa,155 he was a great gnostic and noble master. His brother, our master ‘Ali Wafa, would say about him, ‘This is the treasury of knowledge from which I expend.’ His death took place in AH 814. Their noble lineage ultimately traces back to the Idrisids, the scions of the Prophet who settled in Morocco and nearby areas. They are specifically from the progeny of Imam al-Hasan b. ‘Ali b. Abu Talib, may Allah have mercy on both of them. The ancestor of the Wafa’i shaykhs is thus Mawlay Idris I 156 of Zarhun 157 , his burial place after his death in AH 157. He was survived by his son, our liege and master Idris al-Azhar (the Most Radiant),158 the founder of the city of Fez, and the very reason behind its establishment. Have the rank of a slave, while the masters are masters. Through this door, one can access a mosque gathering all virtues. It is surmounted by lamps resembling chandeliers. The five daily prayers, the Friday prayer and the two ‘Id prayers are established there, and it is populated by the remembrance of Allah Most High, recitation of the Qur’an, and the reviving the Sunna. This mosque comprises a niche of coloured marble: it has two small columns of white marble. The mosque is flanked by a pulpit with words engaved in reddish gold. Its wood is hazelwood, and there is a crescent made of pure copper coated with gold. There are four estrades in the mosque, separared by a courtyard, the floor of which is paved with mud tiles. The floor of the mosque is paved with carpets and rugs. The last of the masters to die was Sidi `Abd al-Khalid al-Sadat b. Wafa. He was allocated a separate closet above which his name was engraved. This mosque has endured until the present times, and the rites of Islam are established in it. O Allah, we ask You by their secrets and rank with You to make us die with love for them and to sustain us by their lights, amin. 151 Also known as al-Bakhili. 152 It is an old town on the Nile, in Upper Egypt, surrounded in the west by a small mountain. 153 Rhoda Island located on the Nile in central Cairo. 154 For his biography, see Tabaqat al-Sha`rani (2122). 155 See his biography in Tabaqat al-Shadhiliyyat al-Kubra by Muhyi al-Din al-Tu’ini (p. 138). 156 Refer for his biography to al-A`lam (1/279) and al-Nasiri’s fi Akhbar Duwal al-Maghrib al-Aqsa (1/67). 157 It is a mountain near Fez, “inhabited by countless people”, as stated by Yaqut al-Hamawi in Warn al-Buldan (3/140). 158 He is Idris b. Idris b. `Abdullah b. al-Hasan II, Abu’l-Qasim (d. 828/1424), the second ruler of Morocco from the Adarisa Dynasty, and the founder of Fez. He was born in Walild, his father passing away while he was still a foetus. Upon his father’s death, the political affairs of the Berbers were managed by Rashid. After the latter’s death in AH 186, Idris was switched to the guardianship of Abu Khalid al-‘Abdi until he turned eleven, whereupon the Berbers swore allegiance to him in the mosque of Walila, in AH 188. He then took over his father’s throne and ruled in a praiseworthy manner. He was generous, eloquent and resolute. He was loved by his subjects and succeeded in winning over the inhabitants of Tunis, Tripoli in Lybia and Islamic Spain. Walila was crowded by outside delegations and by locals, which is why he planned the foundation of Fez in the year AH 192, as mentioned by the author in detail. After visiting Tlemcen in present-day Algeria, he returned to Fez, where he was unanimously supported by the Berber and Zanata tribal groups. The Moroccans separated themselves from Abbasid rule, from the outermost Sus region until the Shalaf Valley near Tangier. The whole of Morocco was stable under his rule, and he minted coins in his name. He passed away in Fez. 159 It is a Moroccan city near Tangiers (Mu jam al-Buldan, 5/384). 16o ‘Umayr b. Mus’ab b. Khand b. Harthama b. Yaild b. al-Mulahhab b Abu sufra al-Azdi was a wazir and political leader after whom the spring of ‘Ayn `Umayr, not far from Fez, is named. He was, together with his father, in al-Andalus when the Moroccan Caliphate fell into the hands of Idris b. Idris. ‘Umayr went to visit him with a delegation of fellow Azd tribesmen. Idris al-Azhar appointed him as close adviser ( wazir) and as head of his army, in addition to giving in marriage to him one of his daughters, named ‘Atika. When Idris al-Azhar founded the city of Fez, he sent ‘Umayr to the place in which the said spring was located, which is why it took his name. He was one of the chivalrous Arab chiefs of his times. He died in Fez. He is the ancestor of Bana al-Maljum, a clan who bequeathed some notable judges from Fez. Muhammed Vefa Efendimiz ariflerin büyüklerindendi. Oğlu Ali Efendimize ise onun evliyaların mühürü ve ali rütbelerin sahibi olduğunu söylemiştir. Şeyh hazretleri ümmiydi, ehli tasavvufun ilminde farklı bir dili ve bir çok eseri vardı. Bu eserleri çocukluk yıllarında 7 ya da 10 yaşındayken kaleme aldı. Bununla birlikte yetişkin yaşlarında da yazdı. Manzumelerinde ve nesirlerinde kullandığı kinayeler günümüzde dahi gizemli görünmektedir. Bildiğimiz kadarıyla manalarını kimse çözememiştir. Vefa olarak anılmıştır, çünkü Nil nehri bir yıl durmuş ve o yıl yükselmemişti. (Nilin yükselmesi -Vefa-u Nil- her Ağustos ayında Nilin suyunun yükselmesidir ve bundan bir çok verim elde edilir). Mısır halkı çözüm olarak göç etmeye karar vermişti. Şeyh ise nehre doğru geldi ve dedi ki: ‘Allah tealanın izniyle yüksel.’ Nehir o gün 17 zira’ ölçüsünde yükseldi. Bu yüzden ona Vefa dediler. Eserlerinden bazıları: Kitabul Aruş, Kitabul Şe’air ve büyük şiir koleksiyonu olarak sayılabilir. Şeyh Efendi hicri 702 yılında İskenderiye’de doğdu ve orada büyüdü. Ebul Hasan eş-Şazili hazretlerinin tarikatını İmam, büyük müsellik Davud ibn Mahil eliyle almıştır. Şeyh sonraları İhmim’e (Nil sahili üzerinde eski bir belde) doğru yönelmiş, orada evlenmiştir. Büyük bir zaviye inşa etmiştir. İnsanlar onu akın akın ziyaret etmiştir. Sonra Mısır’da Ravda’ya gitmiş, orada Allah’a ibadet ile niyaz etmek ve Allah Teala’nın zikriyle meşgul olmak için kalmıştır. Namı uzaklarda yayılmış, ismi şark ve garp topraklarına aşmıştır. [Babası vefat ettiğinde] çok küçüktü. Abisiyle birlikte ve vekilleri Şeyh Muhammed ez-Zeyla’a’nın gözetiminde büyüdü. Şeyh Ali vefa hazretleri 17 yaşına eriştiğinde babasının makamını almış ve düzenli dersler vermeye başlamıştır. İsmi birçok beldede anılmış, ona tabi olanların ve müridlerinin sayıları artmıştır. En çok ikamet ettiği yer Ravdaydı. Kendisine ait bir çok hizib, vird, münacaat, nasihatler ve şiir divanı vardır. Ravda’daki evinde 807 yılının Zilhicce ayında bir salı günü vefat etmiştir. Abu’l-Abbas Ahmad, Abu’l-Tayyib, Abu’l-Tahir ve Abu’l-Qasım isimli oğulları vardır. Kutup İmam Şa’rani hazretleri demiştir ki: Ali Vefa efendimiz fazilet ve kemalin, zerafet ve cemalin had safhasındaydı. Mısır’da ondan daha büyük biri, yüz ve dış görünüş bakımından daha güzel biri görülmedi. Meşhur bir nazmı ve içinde ehli tarikin sırları yazılmış dakik muvassah tarzı şiiri vardır. Kendisine fark, tefsil ve cem lisanı verilmiş, ki bu pek az evliyaya verilmiştir. محمد وفا بن محمد النجم بن محمد السكندري، أبو الفضل أو أبو الفتح، المعروف بالسيد محمد وفا الشاذلي. رأس (الوفائية) ووالدهم، بمصر، مغربي الأصل، مالكي المذهب، ولد ونشأ بالإسكندرية، وسلك طريق الشيخ أبي الحسن الشاذلي، ونبغ في النظم، فأنشأ قصائد على طريقة ابن الفارض وغيره من (الاتحادية). ورحل إلى إخميم فتزوج واشتهر بها وصار له مريدون وأتباع، وانتقل إلى القاهرة، فسكن (الروضة) على شاطئ النيل، وكثر أصحابه، وأقبل عليه أعيان الدولة، وتوفي بها، ودفن بالقرافة. كان واعظاً، لكلامة تأثير في القلوب، ويقال: كان أمياً. وللشيخ عبد الوهاب الشعراني (كتاب) في مناقبه. له: (ديوان شعر -خ) و(نفائس العرفان من أنفاس الرحمن -خ) و(الأزل -خ) و(شعائر العرفان في ألواح الكتمان -خ) و(العروش -خ) و(الصور -خ) و(المقامات السنية المخصوص بها السادة الصوفية -خ). وإليه يُنسب هذا البيت العظيم. قال القطب الشعراني رضى الله عنه في «الطبقات»: كان سيدنا محمد وفا من أكابر العارفين، وأخبر ولده سيدي علي رضى الله عنه أنه هو خاتم الأولياء، صاحبُ الرتبة العلية، وكان أُمِّيًّا، وله لسان غريب في علوم القوم، ومؤلفاتٌ كثيرة، ألَّفها في صباه، وهو ابن سبع سنين أو عشرٍ، فضلًا عن كونه كهلًا، وله رموزٌ في منظوماته ومنثوراته مُطَلْسمة إلى وقتنا هذا، لم يفكَّ أحدٌ فيما نعلم معناها. وسُمِّي وفا لأنَّ بحر النيل توقَّف فلم يزد إلى أوان الوفاء()، فعزمَ أهلُ مصرَ على الرحيل، فجاءَ إلى البحر، وقال: اطلع بإذن الله تعالى. فطلعَ ذلك اليوم سبعة عشر ذراعًا، وأوفى، فسمُّوه وفا. وله مؤلفات منها: «كتاب العروش» وكتاب «الشعائر» وديوان عظيم، ومؤلفات أخرى. وأول قادم من المغرب إلى ثغر الإسكندرية جدُّه سيدي محمد النجم: كان رحمه الله من أصحاب الأحوالِ الباهرة، والكرامات الظاهرة، ترجمه غيرُ واحد، واجتمعَ بالقطب سيدي إبراهيم الدُّسوقي رحمه الله، وأخذ كلٌّ منهما عن صاحبه، ومولده بتونس، فإنَّ أُصولَهم منها، ومن بلاد صفاقص وأحوازها، فاستوطن سيدي محمد النجم إسكندرية، وطابت له الإقامة، ورُزق فيها بابنه سيدي محمد الأوسط أبي مولانا محمد وفا. وكان مولانا محمد الأوسط مشهورًا بالولاية، ومن أصحاب العلم والفضل. وتوفي رحمه الله شابًّا عن ولده محمد وفا، ودُفن بزاويتهم المعروفة بالزاوية النَّجمية، نسبةً لوالده محمد النجم المدفون بها بثغر الإسكندرية. ولما تُوفّي مولانا محمد وفا رضى الله عنه تركَ ولديه مولانا عليّ وفا، ومولانا شهاب الدين أحمد. وكان مولانا عليٌّ إذ ذاك صغيرًا، فنشأ مع أخيه في كفالة وصيِّهما الشيخ محمد الزَّيْلَعي، ولما بلغَ مولانا عليٌّ من العمر سبع عشرة سنة جلس مكان أبيه، وعمل الميعاد، فشاع ذكرُه في البلاد، وكثرتْ أتباعه ومريدوه، وكان أكثرُ إقامته بالرَّوضة، وله أحزابٌ وأوراد وتوجُّهات وتصانيفُ كثيرة، وديوان شعر، توفي بمنزله في الرَّوضة يوم الثلاثاء اثنين من ذي الحجة سنة ثمان مئة وسبع، وله من الذكور أبو العباس أحمد، وأبو الطيب، وأبو الطاهر، وأبو القاسم، وقد ترجَمه غيرُ واحدٍ من الأعيان. قال القطب الشعراني رضى الله عنه: كان مولانا عليّ وفا في غايةِ الفضل والكمال، والظَّرف والجمال، لم يُر في مصرَ أكملَ منه، ولا أجمل وجهًا ولا ثيابًا، وله نظمٌ شائع، وموشحات رقيقة نسجَ فيها أسرارَ أهل الطريق، وأُعطي لسان الفرق والتفصيل زيادة على الجمع، وقليل من الأولياء من أُعطي ذلك. وكان رضى الله عنه كثير التحجُّبِ هو وأخوه مولانا شهاب الدين أحمد لا يخرجان إلا عند حملِ الميعاد. ولما تُوفِّي مولانا عليٌّ رضى الله عنه لم تُر قطُّ جنازةٌ مثل جنازته، كانت جماعته وأصحابُه يمشون أمامها، ويذكرون الله بطريقةٍ تلينُ لها قلوبُ الجفاة. ومولده بالقاهرة سنة 759. وأما أخوه شهاب الدين أحمد بن وفا كان رضى الله عنه عارفًا جليلًا، وسيدًا نبيلًا، وكان أخوه مولانا علي وفا يقول عنه: هذا خزانة العلم، وأنا أُنفقُ منها. وكانت وفاته سنة أربع عشرة وثمان مئة. وينتهي نسبُهم الشريف إلى الأشراف الأدارسة سكَّانِ المغرب الأقصى وأحوازه، أولاد الإمام الحسن بن علي بن أبي طالب رحمهما الله وجدُّهم مولانا إدريس الأكبر رضى الله عنه() صاحب زَرْهُون() ودفينُها، المُتوفّى سنة مئة وخمسين وسبعين عن ولده سيدنا ومولانا إدريس الأزهر() منشئ مدينة فاس رضى الله عنه، وسبب إنشائه لها لمَّا تمكَّن سلطانُه في المغرب، وصفا له الجو، وكثرت الوفود من العرب عليه، وضاقتْ بهم مدينة وَلِيلَى()، أَراد أن يَبني لنفسه مدينةً يسكنها هو وخاصَّتُه، ووجوه دولته، فركب يومًا في جماعةٍ من حاشيته، وخرجَ يتخيَّرُ البقاع، فوصل إلى جبل زالغ، فأعجبه ارتفاعه، وطيبُ هوائه وتربته، فشرع في البناء فيه فبنى بعضًا من الدور، ونحوَ الثُّلث من السور، فأتى السيلُ في بعض الليالي فهدمَ الدور والسور، فكفَّ عن البناء إلى أن بعث وزيره عُميرَ ابنَ مُصعب الأزدي يرتاد موضعًا يبني فيه المدينة التي عزم عليها، فنزل هو وجماعةٌ من الحاشية حتى انتهى إلى فحصِ سايس، فأعجبه المحلُّ، فأوغل فيه حتى انتهى إلى العيون التي ينبع منها وادي فاس، فرأى بها من عناصر الماء ما ينيف عن الستين عنصرًا، فاستطابه، فرجع إلى مولانا إدريس الأزهر رضى الله عنه لينظر إلى البقعة، فأعجبته، فاشترى الغيضة() من بني الخير، وبني يرغش، وأسلموا على يديه، وشرعَ في بناء المدينة، وانتقل إليها هو وأولاده، وبنى بها الجامعَ المعروف بجامع الأشياخ، وأقامَ فيه الخطبة، ثم أخذ في بناء جامع الشُّرفاء، فأتمَّه وأقام فيه الخطبة أيضًا، وبنى دارَه المعروفة بدار القيطون، التي يسكنها الشرفاء الجوطيون، وأدار الأسواق حوله وأمرَ الناس بالبناء، وقال لهم: من بنى موضعًا أو اغترسه فهو له. فبنى الناسُ من ذلك شيئًا كثيرًا. ولما فرغَ من بناء مدينة فاس، وحضرتِ الجمعةُ الأولى صَعِدَ المنبرَ، وخطب في الناس، ورفع يديه، وقال: اللهم، إنَّك تعلمُ أنَّي ما أردتُ ببناء هذه المدينة مباهاةً ولا مُفاخرةً، ولا رياء ولا سمعةً ولا مكاثرة، وإنَّما أردت أن تُعبَدَ بها، ويُتلى بها كتابُك، وتُقام بها حدودُك وشرائعُ دينك وسنةُ نبيك محمد صلى الله عليه وسلم ما بقيتِ الدنيا، اللهم وفِّقْ سكانها وقطَّانها للخير، وأعنهم عليه، واكفهم مؤونة أعدائهم، وأدرر عليهم الأرزاق، واغمد عنهم سيفَ الفتنة والشقاق، إنك على كلِّ شيء قدير. فأمَّنَ الناسُ على دعائه، فكثرتِ الخيرات بالمدينة، وظهرت بها البركاتِ، وقد حقَّقَ الله دعاءه بفضله سبحانه وتعالى، قلَّما تجد فقيرًا إلا وهو في سَعَة من الرزق، وما من عام يمرُّ إلا وقد تخرج منها أولياء وصلحاء لا يُحصيهم إلا خالقُهم. وكان وفاة مولانا إدريس الأزهر رضى الله عنه ثاني جُمادى الآخرة سنة ثلاث عشرة ومئتين، وعمره نحو ست وثلاثين سنة، ودفن بمسجده بإزاء الحائط الشرقي منه، ومقامُه في حضرة فاس من الأماكنِ المقدَّسةِ، تُستشفى به أهلُ المغرب قاطبةً، وهو بمثابة الإمام أبي عبد الله الحسيني رضى الله عنه بمصر، تقصدُه الزّوارُ من الأماكن البعيدة، ويقرؤون عنده «الدلائل» والأحزاب، وله أوقافٌ كثيرةٌ. اللهم انفعنا بهم، وبأسرارهم. ويُدخل من الباب المذكور إلى مسجدٍ جامعٍ لجميع المحاس، أعلاه قناديلُ تقارن الثُّريا()، تُقام فيه الصلوات الخمس بالجماعات والجمعة والعيدان، معمورًا بذكر الله تعالى، وتلاوةِ القرآن، وإحياء السنن، ويشتملُ هذا المسجد على محرابٍ مبنيٍّ بالرخام الملون، به عمودان صغيران من المرمر الأبيض، يُجاوره منبرٌ منقوشٌ بالذهب الأحمر، وخشبُهُ من خشب الجوز، وله هلالٌ من النحاس المصفّى المُموَّه بالذهب، وبالمسجد أربعةُ لواوين() وبينها الصحن، وأرضُهُ مفروشةٌ بالبلاط الكذان()، وقد فُرشت أرضُ المسجد بالبسط والسجاد. ويَرى الداخلُ في وسطه مقصورةَ ضريحِ القطب الكبير سيدي أبي الحسن علي بن وفا، ووالدِهِ القطبِ الغوث، الفرد الجامع، خاتم الأولياء، المحمدي، وعلى دائرة هذه المقصورة أبيات مكتوبةٌ بالذهب، وبجوارها حوضٌ كبير من الرُّخام المرمر، موضوعٌ به الرملُ الأحمر، وتجاه باب المقصورة مكتوبٌ بالذهب: (لا إله إلا الله الواحدُ الحيُّ الدائم العلي الحكيم محمدٌ رسول الله الفاتحُ الخاتم أصلُ الوفا المشفَّعُ العظيم). وقد كُتب عليه نسبُ حضرة روحِ أرواح اللطائف المحمدية، وسرِّ أسرار كنز المواهب الرحمانية الأستاذ أبي الحسن علي بن وفا بن محمد بن محمد بن محمد النجم بن عبد الله بن أحمد بن مسعود بن عيسى بن أحمد بن عبد الواحد بن عبد الله ابن عبد الكريم بن محمد بن عبد السلام بن حسين بن أبي بكر بن علي بن محمد بن أحمد بن علي بن محمد بن إدريس الأزهر التاج بن إدريس الأكبر بن عبد الله المحض ابن الحسن المثنى بن الحسن السبط بن الإمام علي بن أبي طالب كرم الله وجهه. وتجاه باب المقصورة ثلاثُ مقصورات، بالأولى ضريحُ القطب الرباني سيدي أبي الإسعاد بن وفا، وضريحُ سيدي عبد الفتاح أبي الإكرام، وبالثانية ضريحُ القطب الرباني سيدي محمد أبي الفتح بن وفا، وبالثالثة ضريح القطب الرباني سيدي يحيى أبي اللطف. وفي الإيوان ثلاثُ مقاصير على يمين الداخل من المسجد، بالأولى ضريحُ القطب المعظم سيدي عبد الوهاب أبي التخصيص بن وفا، وبالثانية ضريحُ القطب سيدي أبي الإرشاد، وبالثالثة أربعة أضرحة: ضريحُ القطب سيدي عبد الخالق بن الخير بن وفا، وضريحُ القطب سيدي محمد أبي الإشراق، وضريحُ سيدي محمد أبي هادي بن وفا، وضريحُ القطب سيدي أحمد أبي الأمداد بن وفا، وعلى يسرة الداخل من المسجد مقصورةٌ بها ضريحُ القطب سيدي عبد الرحمن الشهيد بن وفا، وبقيَّةُ السادة متفرِّقون في أنحاء المسجد. وقد كُتب على كلِّ ضريحٍ اسمُ من دُفن فيه، وأمّا ضريحُ سيدي شهاب الدين أحمد أخي سيدي علي بن وفا فهو وأبوه سيدي محمد في ضريحٍ واحدٍ، كلٌّ منهما على سرير، وتجاه ضريحهما سريرُ سيدي عليٍّ بضريح مستقلٍّ من الرخام الأبيض المرمر، ومغطّى بكسوةٍ منقوشةٍ بالذهب. وتجاه هذه المقصورة مقصورةٌ فيها ضريحُ شيخنا سيدي يحيى الشريف القادري أبي السيادات بن وفا شيخ شيخنا سيدي أبي العباس الحضرمي الشاذلي. وآخرُ من توفي منهم سيدي عبد الخالق السادات بن وفا، وله مقصورةٌ مستقلة قد نُقش عليها اسمه، وهذا المسجد باقٍ على حاله إلى الآن، تُقام فيه الشعائر الدينية. اللهم إنّا نسألُكَ بسرِّهم لديك ومكانتهم عندك أن تُميتنا على حبِّهم، وتمدَّنا بأنوارهم. آمين. () محمد الشاذلي بن محمد السكندري، أبو الفضل (النجم) بن محمد (بوفاء) رأس: أو أبو الفتح، المعروف بالسيد محمد وفا الشاذلي. مالكي. مغربي الأصل، ووالدهم، بمصر (الوفائية) ولد بالإسكندرية سنة 702هـ ونشأ بها، وسلك طريق الشيخ أبي المذاهب الحسن الشاذلي، ونبغ في النظم، ورحل إلى (الاتحادية)، وتزوج واشتهر وأصبح له مريدون وانتقل إلى القاهرة وسكن بها وتوفي فيها سنة 765هـ. [«الأعلام» (7/37، 38)]. () وفاء النيل: يرتفع منسوب مياه النيل في شهر آب، وبه تكثر الخيرات. () إِخْميم: بلدة قديمة على شاطئ النيل بالصعيد. [«معجم البلدان» (1/123)]. () علي بن محمد بن محمد بن وفا، أبو الحسن القرشي الأنصاري الشاذلي المالكي، متصوف إسكندري، الأصل، مولد بالقاهرة سنة 759هـ. قال المقريزي: كان جميل الطريقة، مهيبًا معظمًا، وأن أصحابه بحبه. وتوفي سنة 807هـ. [«الأعلام» (5/7)]. () عبد الرحمن بن أحمد بن محمد، أبو الفضل بن أبي الوفاء: شاعر مصري، شاذلي مالكي، ولد سنة 781هـ، ومات في عنفوان شبابه غريقًا في النيل بين الروضة ومصر سنة 814هـ. [«الأعلام» (3/283)]. () انظر: «الأعلام» للزركلي (1/279). () زرْهُون: جبل بقرب فاس فيه أمة لا يحصون. [«معجم البلدان» (3/140)]. () إدريس بن إدريس بن عبد الله بن الحسن المثنى، أبو القاسم، ثاني ملوك الأدارسة في المغرب الأقصى، وباني مدينة «فاس» ولد في وَلِيلَى سنة 173هـ. فقام بشؤون البربر راشد فقتل سنة 186هـ، ثم قام بكفالته أبو خالد العبدي حتى بلغ الحادية عشر، فبايعه البربر في جامع وَلِيلَى سنة 188هـ. وكان جوادًا فصيحًا، أحبته الرعية، واستمال أهل تونس وطرابلس الغرب والأندلس فغصت وَلِيلَى بالوفود فبنى مدينة فاس سنة 192هـ وانتقل إليها، ثم غزا المصامدة، ونفرا فانقادت إليه، وزار تلمسان ثم عاد إلى فاس وصفا له ملك المغرب وضرب السكة باسمه وتوفي بفاس. [«الأعلام» (1/278)]. () وَلِيلَى: مدينة بالمغرب قرب طنجة. [«معجم البلدان» (5/384)]. () الغيضةُ: الشجر الكثير الملتف. و: الموضع الذي يجتمع فيه الماء فينبت فيه الشجر. () الرحيق: الخمرُ. و: ضرب من الطيب. السَّلْسَل: الماء العذب الصافي السلِسُ السهل إذا شرب تسَلْسَل في الحلق. () السُّنْدُسُ: ضربٌ من رقيق الديباج. الأيم: الحية أو ذكر الأفعى. () المرْمَرُ: صخرٌ رخاميٌّ جيريٌّ متحوِّل يتركب من بلورات الكلسيت، يستعمل للزينة في البناء، ولصنع التماثيل ونحوها. () الثُّريا: النجم، وهو اسم لها علم كزيد وعمرو، فإذا قالوا طلع النجم يريدون الثريا. [«مختار الصحاح» (1/270)]. () اللواوين: جمع ليوان: وهو الإيوان: وهو قسم مكشوف من المنزل يشرف على صحن الدار، يحيط به ثلاثة حيطان وله سقف محمول من الأمام على عَقْدٍ. () الكذان: هي الحجارة التي ليست بصلبة سميت البصرة كانت ببقعتها عند اختطاطها واحدة بصرة وبصرة، وقال الأزهري: البصر الحجارة إلى البياض [«معجم البلدان» (1/430)]. جامع السادات الوفائية هو مسجد بمصر. يقع الجامع في سفح جبل المقطم، بالقرب من ضريح ابن عطاء الله السكندرى وضريح أبى السعود أبى العشائر ، وقد أقيم المسجد مكان زاوية تعرف باسم زاوية السادات أهل الوفا تنفيذا للفرمان الذي أصدره السلطان عبد الحميد سنة 1191هجرية. في عام 1777م أمر السلطان عبد الحميد بهدم الزاوية وتحويلها إلى جامع وقام بتنفيذه الوزير محمد عزت باشا محافظ مصر. يقع مسجد السادات الوفائية بشارع التونسى بسفح المقطم وتحديداً بين ضريح أبوالسعود بن ابى العشائر وضريح الشيخ تاج الدين ابن عطا الله السكندرى وقد بنى هذا الأثر مكان زاوية قديمة كانت تعرف باسم زاوية السادات أهل الوفا وقد اعاد بناء هذا المسجد الحالى الوزير عزت محمد باشا بأمر من السلطان عبدالحميد العثمانى وذلك فى سنة 1191 هـ – 1777 م. شرع فى أنشاء الزاوية التى اقيم عليها المسجد الشيخ أبو الانوار محمد الاوسط بن محمد نجم الذى ينتهى نسبة الى الادارسه الاشراف بالمغرب الأقصى أولاد الحسن بن الأمام على بن ابى طالب وكان اكبرهم شهرة وجلالاً واحوالاً هو السيد محمد وفا منشىء المسجد الحالى الذى بين ايدينا. والذى ولد بمدينة الإسكندرية سنة 702 هـ ونشأ تقياً ورعاً محبا للعلم وسلك طريق سيدى الأستاذ ابى الحسن الشاذلى رضى الله تعالى عنه واجتمع بياقوت العرشى وهو أول من عرف باسم ( وفا ) وتجمع المراجع والمصادر التاريخية على انه سمى وفا لان النيل توقف فلم يزد فى أوان الوفا فدعا السيد محمد ربه فوفا النيل فلقبوه بـ ( وفا ) وهو من اكابر العارفين وله مؤلفات اكثرها مازال مخطوطاً فى المكتبة الأزهرية وفى دار الكتب المصرية ومن أهمها نفائس العرفان من انفاس الرحمن وكتاب مناهل الصفا وكتاب المقامات السنية. وتوجه سيدى محمد وفا إلى أخميم بصعيد مصر فتزوج بها وانشأ بها زاوية كبيرة ووفد الناس عليه افواجاً ثم صار الى مصر وأقام بالروضة عاكفاً على العبادة مشتغلا بذكر الله تعالى وطار حديثة إلى الافاق. وتوفى رضى الله تعالى عنه بالقاهرة فى عام 765 هـ – 1363 م ودفن بالقرافة بين ضريحى الشيخ أبو السعود ابى العشائر والشيخ ابن عطا الله السكندرى فهو بذلك يعتبر رأس الوفائية وأول من دفن بهذا المكان الذى هو مسجد الوفائية وقد نعت اولاده واحفاده من بعده بالسادات الوفائية. وترك سيدى محمد وفا ولده على واخاه صغيرن فى كفالة وصيهما تلميذة الشيخ الزيلعى ولما بلغ سيدى على من العمر سبعه عشر عاماً جلس مكان ابيه فى زاويته وشاع ذكره فى البلاد وكثر اتباعه ومريدوه وقد كان رضى الله تعالى عنه فى غاية البهاء والجمال له نظم وموشحات رقيقة فى اسرار اهل الطريقة والتصوف وهو أول من تولى السجادة الوفائية وتوفى فى الروضة سنة 807 هـ وجنازته ضمت خلقاً كثيراً لم تر القاهرة مثلها ودفن مع والده السيد محمد الوفا. لم يتبع هذا المسجد فى تخطيطه النمط العثمانى السائد فى المساجد العثمانية بمصر فى هذه الفترة وانما اتبع تخطيط النمط المملوكى والذى يتكون من صحن اوسط يحيط به اربعه ايوانات كما أن للمسجد مئذنة تقع بالزاوية الغربية على الطراز المملوكى. وأيضاً للأثر واجهه واحده وهى الشمالية الغربية ويتوسطها كتله المدخل اما الواجهات الثلاث الأخرى فهى تقع ملاصقة لمبانى حديثة. فلهذا الأثر واجهه واحده تطل على شارع التونسى وهى الواجهه الشمالية الغربية وهى واجهه حجرية يتوسطها فتحة باب مستطيلة يغلق عليها باب خشبى من مصراعين مصفحين بصفائح من النحاس وكتب على الباب من أعلى بخط النسخ: الأولياء وان جلت مراتبهم فى رتبه والسادات سادات. يعلوهما عقد رخامى تليه لوحة رخامية ذات كتابات مذهبة نصها قوله تعالى: الحمد لله الذى اذهب عنا الحزن ان ربنا لغفور شكور الذى احلنا دار المقامة من فضله لا يمسنا فيها نصب ولا يمسنا فيها لغوب. وعلى امتداد هذه الواجهه بعد المدخل الرئيسى والشباك فتحة باب فرعى معقود بعقد مدبب تفضى الى الطاحونه وإلى السكن الذى فوقها تعلوه كتابات نصها: قد كمل بناء هذا الحرم الوفائى السعيد بعناية الله الملك الحميد فى عام احدى وتسعين ومائه الف من هجرة من له العز والشرف صلى الله عليه وسلم. وفاء وولده القطب ابوالحسن على وهى مقصورة خشبية ترتكز على قاعدة حجرية ذات تكسية رخامية يعلوها صف من الشرافات الخشبية المصنوعة على هيئة الورقة النباتية الثلاثية. والمقصورة من الداخل يتوسطها تركيبة رخامية مغطاة بالنحاس الأخضر وقد غطيت المقصورة بقبة خشبية مقامة على أربع حنايا ركنية. هو اكبر الايوانات اتساعاً وعمقا ويتكون من رواقين بواسطة بائكتين كل بائكة تتكون من اربع أعمدة رخامية اسطوانية ذات قواعد مخروطية وتيجان كورنيشة تحمل خمسة عقود مدببة وقد فرشت ارضية هذا الايوان ببلاطات حجرية وغطى بسقف من عروق خشبية مطبقة بالألواح تزينة زخارف نباتية ملونة وفى الجدار الجنوبى الشرقى من هذا الايوان المحراب. وهو محراب مجوف عبارة عن حنية نصف دائرية ذات عقد مدبب متراجع يرتكز على عمودين رخامين ذوات تيجان خشبية وزين اسفل المحراب بوزرة رخامية وزين اوسطة باشكال نجمية وعلى يمين هذا المحراب المنبر. وهو منبر خشبى يتكون من باب مقدم وريشتين مثلثتين بينهما سلم ينتهى الى جلسة الخطيب تغطى هذه الجلسة قبة خشبية يتوجها هلال من المعدن وقد زين اسفل طراز القبلة على جانبى المحراب بوزرات رخامية ذات اشكال نجمية تعلوها دوائر مغشاة بالفسفياء الملون اما اعلاه فيوجد به ثمان مشربيات خشبية وفى نهايته بجوار المنبر خلوه خاصة بخطيب المسجد كتب عليها: افتح يا فتاح. ويتكون من بلاطة واحدة بواسطة بائكة من اربعة اعمده رخامية اسطوانية ذات تيجان مختلفة تحمل خمسة عقود مدببة ويطل هذا الايوان على الصحن ويوجد فى جدار هذا الايوان فتحة باب تعلوها من الداخل حنيتين متشابهتين معقودتين بعقود منكسرة وعلى يمنها كتبية خشبية تجاورها فتحة شباك وقد فرشت ارضية هذا الايوان ببلاطات حجرية وغطى بسقف خشبى تتوسطة شخشيخة. وهما ايوانان متشابهان يتكون كلا منهما من أسلوب واحد متعامد على جدار القبلة به عمودان رخاميات يحملان ثلاثة عقود مدببة. حيث تشتمل جدران الايوان الجنوبى الغربى منهما على ست قندليات بسيطة ذات احجبة من الزجاج الملون ويشتمل جدران الايوان الشمالى الشرقى على خلوتين فى طرفة الشرقى على بابان كتب على الأول ( ما شاء الله لا قوة الا بالله ) وكتب على الثانى ( اللهم هب لنا الخلوه معك والعزله عما سواك ) اما المستوى العلوى من هذا الايوان فيوجد به خمس مشربيات من خشب الخرط. وقد زينت جدران ايوانات المسجد الاربعة بازار خشبى عليه كتابات زيتية عبارة عن قصيدة شعرية فى مدح بنى الوفا ووزعت فى هذه الايوانات تسع تراكيب خشبية لاتباع الطريقة الوفائية. الحقت بالزاوية الغربية لهذا المسجد مئذنة حجرية تتكون من طراز مملوكى غير عثمانى من قاعدة مربعة مشطوفة الاركان تعلوها دورتات مختلفتان اولهما ذات بدن مثمن فتح المعمار فيه أربعة نوافذ صغيرة معقودة للتهوية والإنارة يقابلها فى الاضلاح الاربعة الاخرى اربع مضاهيات وتنتهى هذه الدورة بشرفة حجرية ترتكز على ثلاث حطات من المقرنصات ويلى ذلك بدن اسطوانى مسمط ثم شرفة ترتكز على صفين من المقرنصات وتنتهى المئذنة بقمة مملوكية على شكل طراز القلة. والمسجد يأتى اليه جميع ابناء الطريقة الوفائية واتباعها من شتى أقطار البلاد ويوجد بالمسجد مدافن كثيرة من السادة الاشراف اتباع الطريقة الوفائية وايضا ضريح صفية السادات وزوجها الشيخ على يوسف صاحب جريدة المؤيد. Sh. Aḥmad ibn ʿAbd Allāh Al-Fāsī 1120 Fas.